The Agama literature includes the Shilpa- Shastra, which covers architecture and iconography. The aspects of temple construction are dealt in Devalaya Vastu; and Prathima deals with the iconography. Sometimes, the term Shipa is also used to denote the art of sculpting; but here Shipa refers to the practice of the technique, while Shastra refers to its principles. The worship dealt with the Agama necessarily involves worship -worthy images. The rituals and sequences elaborated in the Agama texts are in the context of such worship- worthy image, which necessarily has to be contained in a shrine. The basic idea is that a temple must be built for the icon, and not an icon got ready for the temples, for a temple is only an outgrowth of the icon, an expanded image of the icon. And an icon is meaningful only in the context of a shrine that is worthy to house it. That is how the Agama literature makes its presence felt in the Shilpa-Sastra, Architecture. The icon and its form; the temple and its structure; and the rituals and their details, thus get interrelated .Further, the Indian temples should be viewed in the general framework of temple culture, which include not only religious and philosophical aspects but social, aesthetic and economic aspects also. Elaborate rules are laid out in the Agamas for Silpa , describing the quality requirements of the places where temples are to be built, the kind of images to be installed, the materials from which they are to be made, their dimensions, proportions, air circulation, lighting in the temple complex etc. The Manasara and Silpasara are some of the works dealing with these rules. The rituals followed in worship services each day at the temple also follow rules laid out in the Agamas. While describing the essential requirements for a place of pilgrimage , Shipa Shatras of the Agamas elaborate on the requirements of the temple site; building materials; dimensions, directions and orientations of the temple structures; the image and its specifications. The principal elements that are involved are Sthala (temple site); Teertha (Temple tank) and Murthy (the idol). A temple could also be associated with a tree, called the Sthala Vriksham. The Gupta Age marked the advent of a vibrant period of building and sculpting activities. The texts of this period such as the Arthashastra of Kautilya and Matsya Purana included chapters on the architecture of the way of summary. By the end of the period, the art and craft flourished; and branched into different schools of architectural thought; but all based on common underlying principles. These principles are now part of Vastushastra, the science of architectural design and construction. . It is explained that the term Vastu is derived from Vasu meaning the Earth principle (prithvi). This planet is Vastu and whatever that is created is Vastu and all objects of earth are Vastu. During the medieval period, vast body of Sanskrit references, independent architectural manuals were written, without reservation, and scattered across the country. Apparently, some attempts were made to classify and evaluate their contents in a systematic way. Of the many such attempts that tried to bring about order and coherence in the various theories and principles of temple construction, the most well known compilations are Manasara and Mayamata. They are the standard texts on Vastu Shastra, and they codify the theoretical aspects of all types of constructions; but specifically of temple construction. These texts deal with the whole range of architectural science including topics such as soil testing techniques, orientation, measures and proportion, divination, astrology and ceremonies associated with the construction of buildings. Manasara is a comprehensive treaty on architecture and iconography. It represents the universality of Vastu tradition and includes the iconography of Jain and Buddhist images. The work is treated as a source book and consulted by all. The Mayamata too occupies an important position. It is a general treatise on Vastu shastra; and is a text of Southern India. It is regarded a part of Shaiva literature and might belong to the Chola period when temple architecture reached its peak. It is the best known work on Vastu. The work is coherent and well structured. It defines Vastu as the arrangement of space, anywhere, wherein immortals and mortals live. These subjects are intertwined with Astrology. The Vastu Texts believe that Vigraha (icon or image of the deity) is closely related to Graha (planets).The term Graha literally means that which attracts or receives; and Vigraha is that which transmits. It is believed that the idols receive power from the planets; and transmit the power so received. It not merely is a symbolism but also one that provides logic for placement of various deities in their respective quarters and directions. The texts that are collectively called Vastu Shastra have their origin in the Sutras, Puranas and Agamas; besides the Tantric literature and the Brhat Samhita. The Vastu texts classify the temple into three basic structures: Nagara, Dravida and Vesara. They employ, respectively, the square, octagon and the apse or circle in their plan. These three styles do not pertain strictly to three different regions but are three schools of temple architecture. The vesara, for instance, which prevailed mostly in western Deccan and south Karnataka, was a derivation from the apsidal chapels of the early Buddhist period which the Brahmanical faith adopted and vastly improved. These three schools have given rise to about forty-five basic varieties of temples types. They too have their many variations ; and thus the styles of temple architecture in India are quite diverse and virtually unlimited . Among the many traditions inherited (parampara) in India, the tradition of Vishwakarma is unique. The mode of transmission of knowledge of this community is both oral and practical; and its theories construct a holistic universe of thought and understanding. The rigor and discipline required to create objects that defy time and persist beyond generations of artists, has imbued this tradition with tremendous sense of purpose, and zeal to maintain the purity and sensitivity of its traditions; and to carry it forward . This has enabled them to protect the purity of the art and skills without falling prey to the market and its dynamics. It is virtually impossible to state when the custom of building stylized temples took hold in our country. The Rig Veda is centered on home and worship at home.There is not much emphasis on temple worship. The term employed in Grihya sutras(Ashvalayana -1.12.1; and parashara -3.11.10) to denote a temple was Chaithya , which literally means, piling up ; as piling up of the fire alter ,agni_chiti from bricks (as in agni-chayana).This perhaps suggests that chaitya implied piling up bricks to form a shrine. This is consistent with the view that the earliest temples were relatively simple piled brick structures. The use of the term Chaithya to denote a place of worship appears to have been in vogue for quite a long period after the Vedic age . In Mahabharata, the Rishi Lomaharsha mentions to Yudhistira that the tirtha on the Archika hill is a place where there are chaityas for the 33 gods (MBh 3.125).He also advises Pandavas to visit the Chaityas on the banks of the Narmada (MBh 3.121). Mahabharata often refers to Chaithyas as being close to Yupas (chaithyupa nikata bhumi); Yupa being the spot where a major Yajna was performed. It is possible that small shrines were erected on the Yupa site to commemorate the Yajna. Ramayana too mentions that Meghanada, the son of Ravana, tried to perform a Yajna in a temple located in the Nikhumba grove. Zarathustra demands from Ahur Mazda “Tell me, can I uproot the idol from this assembly that set up by the angras and the karpanas?”. At another time, the Emperor Xerxes, a follower of Zarathustra declares “I destroyed this temple of daevas”. The Buddhist and Jain texts mention of a certain Chaithya of Devi Shasti, consort of Kumara, at Vishala. Jain texts, in particular, mention the Chaithyas of Skanda in Savasthi; of Shulapani (Rudra) and of Yakshini Purnabhadra. Therefore by about six hundred BC, the Chiathyas were quite common. They were perhaps small-sized constructions (usually of brick) surrounded by groves of ashvattha or audumbara trees. The Maurya period described in the Artha-shastra, had Chaithyas for a number of Devis and Devas, such as Indra, kumara, Rudra, and Aparajita etc. A description of the Chaitya of goddess kaumari suggests that it had multiple Avaranas, one enclosing the other ; and, the outer Avarana having a circular arch. By the time of the Mauryas, the Chaithyas appeared to have steadily gained importance; and , become an integral aspect of city life. However, there is nothing to suggest that they were large structures like the classical Hindu temples that were to follow later. The Buddhism, in its initial stages, rejected the of the Vedic practices; however, in due course, it came to adopt some features of the old religion. For instance; the ‘piling’ (Chayana) of the Vedic fire-altar was transformed into a Buddhist Chaitya. It is likely that the Buddhist Chaitya was initially meant to be a funeral pyre. But, in the later periods, it became a prime symbol of the Buddhist architecture. And, similarly, much later, Homa (offering oblation into the fire) became an accepted practice in the Mahayana Buddhism. By about first century BC , the Buddhist places of congregation either as caves carved into rocks or as free standing structures, came to be known as Chaithya_grihas. These were patterned after the shrines of Vishnu, with the form of the fire altar being placed on the raised platform in the apse of the Chaithya hall. The term Chaithya later came to increasingly associated with the Buddhist Stupas or places of worship. It was perhaps during the period of the Imperial Guptas that a Hindu temple came to be regularly addressed as Devalaya, the abode of Gods. The oldest of the surviving structural shrines date back to the third or even fourth century A.D .They are made of bricks. Some of the them might perhaps been temporary structures, erected on occasions of community-worship. The canonical concept of pavilion (mantapa) suggests that they might have been pavilions to accommodate those who gathered to participate in the worship ritual. It is only later that structures tended to be permanent bigger. The earliest temples in north and central India which have survived the vagaries of time belong to the Gupta period, 320-650 A. D. ; such as the temples at Sanchi, Tigawa (near Jabalpur in Madhya Pradesh), Bhumara (in Madhya Pradesh), Nachna (Rajasthan) and Deogarh (near Jhansi, Uttar Pradesh).They consist of a square, dark sanctum with a small, pillared porch in front, both covered with flat roofs. The brick temple at Bhitargaon ; and the Vishnu temple at Deogarh, built entirely of stone , both , have a square sanctum, but instead of a flat roof there is a pyramidal superstructure (sikhara). The rock-cut temple and monastery tradition also continued in this period, notably in western India, where the excavations—especially at Ajanta acquire extreme richness and magnificence. The temple groups at Aihole and Pattadakal in North Karnataka date back to about 5th century, and seem to represent early attempts to experiment with several styles and to evolve an acceptable and a standard regional format. Here, temples of the northern and the southern styles are found next to each other. Besides, Badami, the capital of the Early Chalukyas, who ruled much of Karnataka in the 6th to 8th centuries, is known for its ancient cave temples carved out of the sandstone hills above it. The school of architecture in South India seems to have evolved from the earliest Buddhist shrines which were both rock-cut and structural. The later rock-cut temples which belong to 5th or 6th century A.D. were mostly Brahmanical or Jain, patronized by three great ruling dynasties of the south, namely the Pallavas of Kanchi in the east, the Calukyas of Badami in the 8th century A.D, the Rastrakutas of Malkhed came to power and they made great contributions to the development of south Indian temple architecture. The Kailasanatha temple at Ellora belongs to this period. 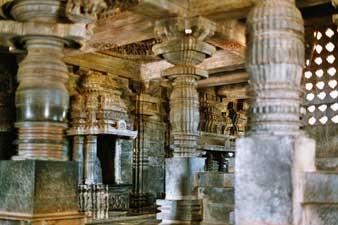 The next thousand years (from600 to 1600 A.D.) witnessed a phenomenal growth in temple architecture. The first in the series of Southern or Dravidian architecture was initiated by the Pallavas (600-900A.D.) The rock-cut temples at Mahabalipuram (of the ratha type) and the structural temples like the shore temple at Mahabalipuram and the Kailasanatha and Vaikuntha Perumal temples in Kancheepuram (700-800 A.D.) are the best representations of the Pallava style. The Kailasanatha (dating a little later than the Shore Temple), with its stately superstructure and subsidiary shrines attached to the walls is a great contraction. Another splendid temple at Kanchipuram is the Vaikuntha Perumal (mid-8th century), which has an interesting arrangement of three sanctums, one above the other, encased within the body of the superstructure. The Talapurisvara temple at Panamalai is another excellent example. The Pallavas laid the foundations of the Dravidian school which blossomed during the Cholas, the Pandyas, the Vijayanagar kings and the Nayaks. Most important of a large number of unpretentious and beautiful shrines that dot the Tamil countryside are the Vijayalaya Colisvara temple at Narttamalai (mid-9th century), with its circular sanctum, spherical cupola, and massive, plain walls; the twin shrines called Agastyisvara and Colisvara, at Kilaiyur (late 9th century); and the splendid group of two temples (originally three) known as the Muvarkovil, at Kodumbalur (c. 875). The Vijayalaya Colisvara temple, with its first and second thala (base) of the vimanam square in shape, the third in circular (vasara) and the griva and Sikhira also in circular shape; is a forerunner of the magnificent temple at Gangaikondacholapuram built by Rajendra Chola. The vimana is a fine mixture of Nagara and Vesara styles. These simple beginnings led rapidly (in about a century) to grandeur and style. The temples, now built of stone, were huge, more complex and ornate with sculptures. Dravidian architecture reached its glory during the Chola period (900-1200 A.D.). Among the most magnificent of the Chola temples is the Brhadishvara temple at Tanjore with its 66 metre high vimana, the tallest of its kind. The later Pandyans who succeeded the Cholas improved on the Cholas by introducing elaborate ornamentation and huge sculptural images, many-pillared halls, new annexes to the shrine and towers (gopurams) on the gateways. The mighty temple complexes of Madurai and Srirangam set a pattern for the Vijayanagar builders (1350-1565 A.D.) who followed the Dravidian tradition. 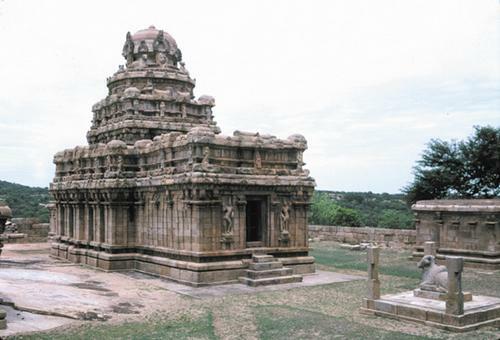 The Pampapati Virupaksha and Vitthala temples in Hampi are standing examples of this period. The Nayaks of Madurai who succeeded the Vijayanagar kings (1600-1750 A.D.) made the Dravidian temple complex even more elaborate by making the gopurams very tall and ornate and adding pillared corridors within the temple long compound. The Hoysalas (1100-1300A.D.) who ruled the Kannada country improved on the Chalukyan style by building extremely ornate, finely chiseled, intricately sculptured temples mounted on star shaped pedestals. The Hoysala temples are noted for the delicately carved sculptures in the walls, depressed ceilings, lathe-turned pillars in a variety of fanciful shapes ; and fully sculptured vimanas. 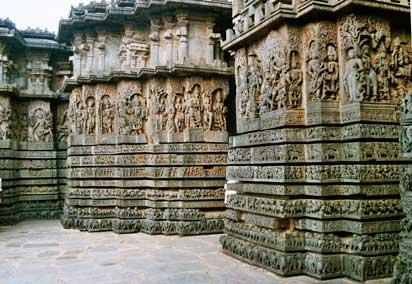 The exterior is almost totally covered with sculpture, the walls decorated with several bands of ornamental motifs and a narrative relief.Among the more famous of these temples, which are classified under the Vesara style, arethe twin Hoysalesvara temple at Halebid, the Chenna Kesava temple at Belur (1117), the Amrtesvara temple at Amritpur (1196), and the Kesava (trikuta) temple at Somnathpur (1268). 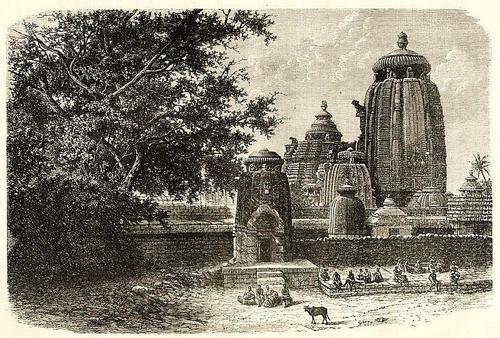 In the north, the major developments in Hindu temple architecture were in Orissa (750-1250 A.D.) and Central India (950-1050 A.D.) as also Rajasthan (10th and 11th Century A.D.) and Gujarat (11th-13thCentury A.D.). 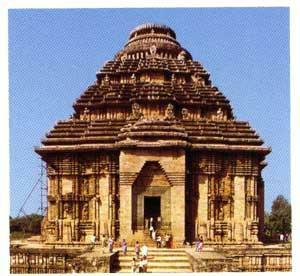 The temples of Lingaraja (Bhubaneswar), Jagannatha (Puri) and Surya (Konarak) represent the Kalinga-nagara style. The greatest centre of this school is the ancient city of Bhubaneswar, which has almost 100 examples of the style, both great and small, ranging from the 7th to the 13th century. The most magnificent structure, however, is the great Lingaraja temple (11th century), an achievement of Kalinga architecture in full flower. The most famous of all Kalinga temples, however, is the colossal building at Konarak, built by the Chandellas, dedicated to Surya, the sun god. The temple and its accompanying hall are conceived in the form of a great chariot drawn by horses. The Surya temple at Modhera (Gujarat) and other temple at Mt. Abu built by the Solankis have their own distinct features in Central Indian architecture. Bengal with its temples built in bricks and terracotta tiles and Kerala with its temples having unique roof structure suited to the heavy rainfall of the region developed their own special styles. Hindu temples were built outside India too. The earliest of such temples are found in Java; for instance the Shiva temples at Dieng and Idong Songo built by the kings of Sailendra dynasty ( 6th -9thcentury). The group of temples of Lara Jonggrang at Paranbanam (9th to 10th century) is a magnificent example of Hindu temple architecture. 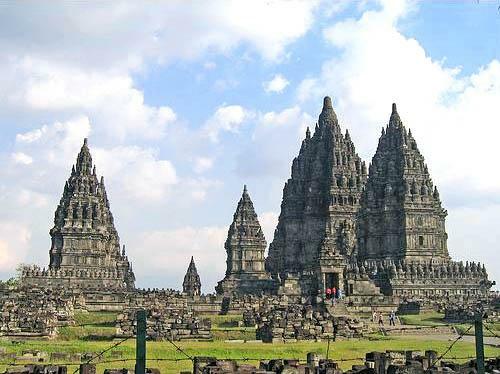 Other major temples are: the temple complex at Panataran (Java) built by the kings of Majapahit dynasty (14century); the rock-cut temple facades at Tampaksiring of Bali (11th century); the Mother temple at Beshakh of Bali (14th century); the Chen La temples at Sambor Prei Kuk in Cambodia (7th – 6th century); the temples of Banteay Srei at Angkor (10th century) and the celebrated Angkor Vat temple complex (12th century) built by Surya Varman II. Thank you for the visit and the appreciation. Please do read the other articles in the sei=ries ; as also the ones on the other subjects. but i am wondering .. you should compile all this in a book form..this is rare ,brilliant well chronicled and wonderfully articualted material.. well researched too. frankly i have not come across a blogger with such deep comittment and researching rigour like you.believe me the insight that iam deriving out of your writing is not just informative but spirtual.. you are indeed a rare relic of the ancient wisdom…. only very fortunate souls have access to this vidya..
if you were born a thousand years earlier you would have been hailed as a great rishi…. i feel like crying whaen i find that there are very few who want to unearth the pearls of wisdom from the seers of the distant past who talked in language of symbols and patterns. my work in groiup therapy is largely based on language of the patterns and symbols…. please do take your own time in answering..
as i mentioned, it is virtually impossible to state when the custom of building stylized temples took hold in our country. i picked up the thread from the third or the fourth century ad. the earlier structures were perhaps of perishable materials such as wood or bricks (istaka) as excavated at sites of the indus valley civilization. it appears bricks were in use in the 6th century bc, too. those structures surely have perished, except, perhaps for the stupas, remains from the 2nd century bc to the 4th century. traditions of stone architecture appear to be more recent than wood or brick, the earliest examples of the use of dressed stone for building purposes do not the 6th century bc.i think , the stone architecture flourished from 4th century ad , coinciding with the advent of the gupta period. in between these two periods , the caves carved into rocks or rock-cut monasteries appears to have been rather common(e.g.uparkot in junagadh, gujarat, is a remarkable series of rock-cut structures dating from the 3rd–4th century ad). this was also an era when gandhara and south indian, sculptured decoration extended to the stupa. the gupta period starting with the close of the 4th and the beginning of the 5th century ad marked the opening phase of an architecture initiationof a new movement, leading to the great and elaborate temples of the 8th century onward.the mahabodhi temple at buddha gaya, commemorating the spot where the buddha attained enlightenment might essentially be a temple of the gupta age. 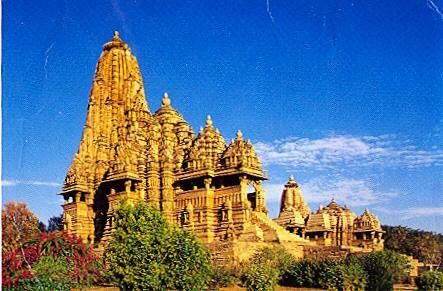 it has a majestic sikhara, decorated with ornamental niches , rising over a square sanctum. that was the reason; i briefly mentioned the earlier phase and outlined the developments starting from the gupta period. as regards the question whether there were temples in the earlier period, i think, yes, there were temples.. temples and stupas of brick and timber with vaulted roofs, were constructed , on plans that were generally elliptical (gaja pruta – behind of an elephant), circular, quadrilateral, or apsidal (i.e., having an apse, or semicircular plan, at the sanctum end). these structures have not survived, but some idea of their shape has been obtained from the excavated foundations near gaya. principally aihole and pattadakal constructions were renderings and improvisations in stone of the earlier wood or brick structures .they were the forerunners of the architecture that flourished in the later centuries. thanks for reading. please do follow the rest six posts and let me know. please look into the other parts too. Hundreds of thanks Was searching for this . Great. Dear Manjunath, thanks for the visit. Please do read the entire series. Thank you Dear Mukund, I am glad you found it useful. I trust you read my entire series on Devalaya Vastu. Whatever I have written is from the traditional texts on Vastu and Shilpa-shatra. I am not familiar with the ‘software’ aspects of Vastu. Pardon me ,if I have not been of help to you . Please read the other articles also. We have a temple of Adishakti. We need your suggestions on our temple vaastu. how do we contact you. my email id is narasimharaya@rediffmail.com. Thankyou for these artilce, so complex and comprehensive.I havefound here most of information thath i need in these moment for my job. Thank you Dear Magdalena for your visit and the appreciation. You are welcome. Please do read other articles on other subjects as well.